32, of Granite City, Ill.; assigned to the 2nd Battalion, 502nd Infantry Regiment, 2nd Brigade Combat Team, 101st Airborne Division, Fort Campbell, Ky.; killed Dec. 30, 2005 when an improvised explosive device detonated near his Humvee during patrol operations in Baghdad. While he did not spend his whole life in Maine, he exemplified what a Mainer is. He always wanted to stay busy. Always had a job. He was always a hard worker. He trained many soldiers during his time in the military. Shawn enlisted in the Army to follow in his father’s footsteps. He was in the infantry, same as his father. He wanted his father to be proud of him. Shawn is remembered by his family for his bright blue eyes, his smile, sense of humor, and dancing around the house. Shawn was a loving husband to Stephanie and father to Cameron and Bayleigh. Loving son to parents Robert and Delaine Fugere. 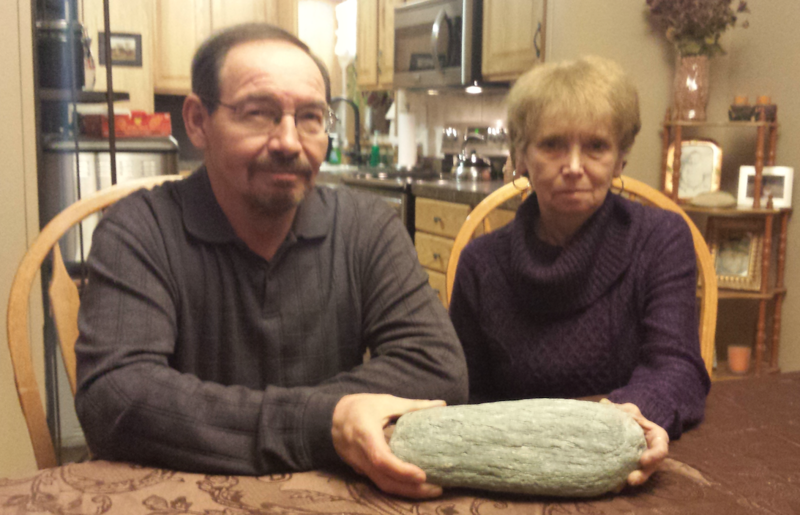 To honor their son, they unearthed and retrieved this stone from Southern Maine Community College in South Portland. Watch this video to learn more about Shawn what this stone symbolizes. MHANF. I had the extreme honor and pleasure of spending this past Sauturday, March 21, 2015 with the Stone of Army SGT 1st Class Shawn C Dostie. We woke up early in order to be in Charlseton by 0700. On the ride up I kept Shawn right next to me. I love his Stone. It has a great feel to it. Smooth but rough at the same time. I would constantly find myself rubbing the stone and tracing the engraving. We listened to lots of different music, not being sure what he would like to listen to. I feel like maybe country was his thing? We arrived at The Highview Christian Academy, where we meet Chad and the rest of the hikers, seven students, one teacher, two parents, and a journalist from the Bangor Daily News. We drove to Borestone Mountain, which would be our playground for the day. There was lots of snow. Everyone got gear ready, strapped on their snow shoes and hit the trail. We had great weather, and the trail conditions were close to perfect. We would hike for a while, then take a few minutes for everyone to regroup, drink water, and maybe eat a snack. When we got to the last few pushes before the summit, the trail became a bit tricky. Luckily Chad had planned for this and brought his rope. Everyone made it through these sections and I know we were able to train them with some very lasting lessons. This was evident on the way back down through these sections. We had to traverse these sections with the rope again, sometimes doing a near repelling action, walking backwards and trusting the directions from below. Shawn was definitely in his element on Saturday. I was glad to have him with me to remind me to think about the others that may need a little coaching and advice. I know all those he trained appreciated and learned many things from him. Thank you for allowing us to carry on his memory for many years to come. Thank you all for your Service and Sacrifice. I read this many months ago( and several times since) and found myself in tears. I always start to reply and then quickly log off because, even after so many years, I find myself way too emotional to put into words how grateful me, the kids, and Shawn’s family are to those who continue to remember him. There is so much I want to say to you about how amazing you must be to take the time out of your life to carry not only his rock with you, but his spirit as well. But, I will simply say Thank You Sir for being the kind of man Shawn was glad to lay down his life for. God Bless you, this Country, and the men and women who continue to fight for our freedom. My name is David J. Cote, nickname “Sandman” and on May 23, 2015 I carried the stories and memorial stones of two post 9/11 fallen Maine heroes to the top of Owl Peak on Baxter State Park as part of The Summit Project. The Summit Project is a nationally recognized, Maine based, non-profit service organization that I founded exactly two years ago. In two years, and with thousands of miles hiked, hundreds of volunteers and dozens of fallen honored, we have fundamentally changed the way our state pays tribute to our post 9/11 fallen service members. With every hike, every new relationship, and every post hike reflection letter (like the one here) we have shown that TSP inspires service, strengthens communities and changes lives. SFC Shawn Dostie, age 32, of Granite City, Ill.; assigned to the 2nd Battalion, 502nd Infantry Regiment, 2nd Brigade Combat Team, 101st Airborne Division, Fort Campbell, Ky.; who was killed Dec. 30, 2005 when an improvised explosive device detonated near his Humvee during patrol operations in Baghdad. Maj Jay T. “Sweet Pea Aubin”, age 36, of Waterville, Maine; assigned to the Marine Aviation Weapons and Tactics Squadron 1, 3rd Marine Aircraft Wing, Marine Corps Air Station Yuma, Ariz.; killed on March 20, 2003 in a CH-46E helicopter crash in Kuwait. For long time veterans of TSP, we know that the hours and weeks that we spend rehearsing and preparing our presentation for the summit ceremony is essential prep work, but when we get to the top, our plan goes out the window and our words are spoken from the heart and NOT from a prepared note card. I spent weeks learning about Shawn and Jay. They were heroes, brave, courageous and patriotic. They were warriors, selfless and giving. These individuals demonstrated the very best in what is important in America and they both revealed the character of what it means to be a Mainer. But the other thing we learn from TSP, is sometimes the stones choose us, rather than us choosing the stones. I think this was the case for my hike on Owl this year. A year ago, my TSP experience was very different. It was our first year of TSP at BSP and I was enamored with the details of planning and executing a complex operation like TSP. It was year one, and I was stressed about every detail. I am glad I carried the memory of James Zimmerman that year. I continue to think of him and how his example helps me lead TSP. This year was different. In only a short time, we have found extraordinary volunteers, a hardworking and dedicated Board of Directors and they have taken on significant pieces of the TSP at BSP mission. I had more time to focus and reflect on the lives represented by the two stones in my pack. I am grateful for this different experience and my team (TEAM BLUE) can tell you that I was impacted in a big way on that mountain top. I was much more connected to the spirit of the fallen this year. I could process what was happening to others, to the families, to me. I could truly appreciate and understand and synthesize, to a degree, the benefit of TSP because I, like others around me, was the one who gained more by giving than receiving. As I hiked the mountain and prepared for TSP at BSP 2015, I tried to personalize, exhibit, and embody ONE key quality from each of the heroes I prepared to carry. I wanted to try to combine their signature trait into a unique blend of virtue that was inspiring me to give more as a servant leader to TSP. From SFC Shawn Dostie, I tried to take on his capacity for HARD WORK. He was a senior enlisted man in the Army. He worked tirelessly not only in uniform but also before ever joining. He stayed busy, he found employment, and he worked long hours, he NEVER complained and was committed to never let someone accuse him of slacking or cutting corners. He was a VERY hard worker. The stories I read about his capacity for hard work inspired me to want to WORK as hard as I COULD on the mission that was important to me – leading TSP. From Maj Jay Aubin, I tried to take on his ability to BE KIND to others. Jay was a field grade officer in the USMC like me. He was a pilot like me; he was practically from the same birthplace as me in Maine. Jay was one of the KINDEST Marines in his unit. He was considerate, benevolent, deliberate and giving. He would never say anything offensive or hurtful. He helped his Marines get home safely from parties. He greeted his fellow Marines and helped his family. He was a kind, considerate and giving. That quality inspired me too. Now my post hike reflection would not be complete without sharing the surprise that happened to me at TSP at BSP 2015 a few hundred yards short of the Owl peak. Two of my friends who were on the hike (Skeletor and Lex) knew that my favorite stone was the BAYONET STONE. The BAYONET stone, unearthed and selected by me, comes from the area near Little Round Top in Gettysburg, PA and represents my childhood and present day historical hero — Joshua Lawrence Chamberlain, with whom I share a passion of public service, a birthday and almost a hometown. Skeletor had carried the Bayonet stone in his pack from the foot of the trail. He found Lex and told him to find me for another hand off. When Lex said to me “Dave – you need to take this to the top” I was so filled with emotion, pride, humility, and inspiration. I just about broke down. Complete surprise, but an honor I will remember forever. I spoke at length about JLC during the circle testimony at the top of Owl Peak. My emotions got the better of me as I shared with my team that I wanted to exhibit the HARD WORK of Shawn Dostie, the KINDNESS of Jay Aubin and the life accomplishments of JLC – a soldier, scholar and statesman from Maine. It that sense, that single action of having the opportunity to carry three stones to the summit, I was inspired, I knew we had built and bolstered a community and I knew my life and lives of others were changed for the better. When we take the time to learn about our heroes (like Dostie, Aubin and Chamberlain), when we take the time to serve one another, we are able to carry on THEIR unfinished work. That special group of people, who call themselves Mainers, can act on that faith, inspired by our fallen, to defend our state, be proud of our state and change our state – for the better. In full circle fashion, it is our fallen heroes, who were motivated to take action in the face of uncertainty, not based on a deterministic outcome, but based on their faith in a higher purpose. They are the ones who give us faith today and help us believe in ourselves and respond to own higher calling. IT is their courageous acts of service and selflessness that instills faith in us, reminds us what HARD WORK and KINDNESS and PUBLIC SERVICE look like and remind us there is still work for us to do. We must remind ourselves, today, and every day, that the measure of progress for those who served and died is whether WE remain willing to work hard together, regardless of our race, our class, our religion, our gender, our political ideology, to be part of something greater than ourselves and surpass our perceived personal limits and overcome the challenges that we face together. To win that battle, to answer that call – is what remains our greatest unfinished business. The promise of the Pine Tree state and the principle of our heroes service’ will only be kept if we work together and continue to give to each other, help one another, carry each other and lift one another to higher places. We can and will solve the problems that we all face together. We can and must live a life worthy of their sacrifice. For TSP at BSP 2015, I thank my fallen heroes of SFC Shawn Dostie, Maj Jay Aubin, and COL Joshua Chamberlain and my living heroes (Lex, Skeletor, Gunny and everyone in our incredible TSP family) for showing me how. Thank you so much for honoring our Hero, SFC Shawn C. Dostie. The only thing harder than losing Shawn is feeling like he will be forgotten. The kids and I are so grateful to The Summit Project and to you for carrying Shawn’s rock and spirit with you. I find it hard to put into words without getting emotional how thankful we are for you and everyone else who gives their own time to remember not only Shawn, but the countless others who have sacrificed their lives for this beautiful Country. We can never thank you enough! God Bless you! On May 24th, 2015 I carried the spirit stone “BAYONETS” to the top to Owl Peak in Baxter State Park as part of the Memorial Day weekend at Twin Pines with The Summit Project. I was never asked to carry this stone nor was I assigned to it. Infact I took it off the table without prior consent from anyone and put it in my ruck. I chose to bring it along side of the stones of Andrew Hutchins and Aaron Henderson as personal “Thank You” to Major David Cote. BAYONETS sits out from the other spirit stones and is usually picked last for a hike. When you see the word next to FAMILY, HONOR, SACRIFICE, and all the others it stands alone and seems somewhat out of place. While it waits on the table being passed over for other stones and memories it does keep it’s silent watch on all that TSP has become. This stone was hand picked by David and engraved with a word that he chose. A little background: I had the privilege of hiking in ANP on Team Bubble with David in October of 2014. I was new to TSP at this point and had only carried one stone at that point in June and had barely met any of the families affected by the tragic loss of their loved ones. It was a hectic morning and Dave was moving us out to the bus to get to the trailheads and in his haste he didn’t grab a stone to hike with. Luckily enough there was a spare in one of our hikers packs: BAYONETS. His eyes lit up and he gave us an impassioned education that morning on his personal hero General Joshua Lawrence Chamberlain. The fire and passion that Dave had in his eyes while he was speaking to us made an impact on me. What I was seeing was the kind of leader I wanted to be. To be such a strength for so many people involved in TSP and to make the time to listen to each and everyone of them is something I wanted to strive for. To be able to make an impact in so many lives as this. Since the ANP hike I have taken myself from “selfish” to “selfless”. I took the cues that day while I was silently observing David and his interaction with the Gold Star Family members to make better decisions for myself and for my community. I have found new family in the Hutchins and made many new friends with the same core-values I have since joining TSP. I have since become friends with Dave and have carried quite a few stones, but more importantly, the memories of our fallen soldiers. As he says, “I’m just a ripple in the pond”. David, you are so much more than that and that is why I chose to bring BAYONETS up with us. I chose to honor my friend that afternoon and all the hikers got to spend a little time hearing about your hero. We passed it down from Team Red to White to David’s Team Blue so he could receive it and take it to the top, too. David, The Summit Project wouldn’t exist without you. The families that are near and dear to all of us now wouldn’t have that link to the love and healing that you created. You are a good man and I’m honored to call you my friend. So, to anyone who sees BAYONETS sitting on the table at future events please pick it last. That is the way Dave would want it to be as the project is not about him, but at least pick it up and give it a quiet “Thank You”. My name is James Mannette, I’m 16 years old, and I recently took on the Summit Project today. I just joined my local RJOTC program that has started up at my High School, and got word of this event that is coming up; I figured this would be the perfect way to make an impact on my life, as well as others. Through carrying the stone of Sgt 1st Class Shawn Dostie, I was assuring that his memories would remain alive forever. I can’t even begin to express how much pride and loyalty I felt to be carrying the life of a special and committed person who sacrificed himself to create a country in which I feel safe. I’ve always looked up to veterans, and it hit me deep down to be honoring one of many fallen veterans, and leading him around his old city. Although Sgt. Dostie is not here physically, his legacy still remains alive through his stone. Upon taking the task of carrying his stone, I also was to learn more about Sgt. Dostie. I learned that Dostie and I shared traits in common; We both are/were very motivated, compassionate, and always looking to help others. We love to work hard, and I strive to be in the military as well. I was honored to carry the memory of the fallen hero, Sgt. Dostie. I feel extreme pride and dignity, and a sense of duty to the hero who sacrificed everything to make a better world for people like myself. Thank you Shawn Dostie, you will never be forgotten! Thank you James for hiking in honor of Shawn. You do sound a lot like him. For as long as amazing people, like yourself, keep these fallen heroes memories alive, they will never truly be gone. You are so young yet you “get it”. You should be so proud of yourself. I know the kids’ and I are very proud of you. God Bless you James! Over the 4th of July weekend, I flew out to Colorado to do some exploring and visit a buddy that I had served with. I took the stones of Wade Slack and Shawn Dostie with me on the trip.. I mentioned to Dan Wells, the friend I was visiting, that I was bringing a stone with me, and he asked if it would be OK to bring one for him to hike as well. Dan is not from Maine, but he, like many other guys I served with, often see my posts about the Summit Project. I thought it was great that he wanted to be a part of the project. I selected Shawn Dostie’s stone for Dan because we had both served in the same battalion as Shawn in Iraq. We were in different companies, and didn’t actually know him personally, but he was part of our family. We operated in the same crappy areas of Iraq, lived in the same camp, and probably worked together on some of the larger operations. It was nice to be able to have a common thread that linked us all together, thousands of miles from Maine. We climbed Twining Peak, near Independence Pass, in the Colorado Rockies. It was 13,750′ at the summit. The hike was especially hard for Dan, because he has had several knee surgeries from Army injuries (the infantry is not the best career for one’s knees.) Regardless of how bad his legs hurt, Dan took Dostie’s stone all the way to the top, where we enjoyed one of the best views I have ever seen, and took some pictures with our stones. For Shawn’s stone, I brought a 101st Airborne patch from one of my old uniforms and a Strike brigade coin to put next to it. The Summit Project means so much to the people who have been a part of it. It brings different people together to accomplish a sacred duty, and creates a new family among its ranks during the process. It gives a small window into the world of what it is like to live with the loss of a comrade for those who have never served, and for those who have served, it’s a glimpse into the life of what it is like to lose a spouse or family member. The hike is just a hike, and the stone is just a stone, but the personal connection one feels as they learn about this person and finally heft their stone can not be described. It is both good and bad. Joy and sorrow. But, we are alive, and while we are, so to shall be the legacies of the men and women that these stones represent. I want to start by thanking you for allowing us to take your loved ones on our trek, they made our trip what it was, so very inspiring and special. I as well as 17 year old Parker Bradbury, his twin brother, Noah, their 13 year old sister Faith and their Dad, George Lee Bradbury had the honor of taking not only Sgt. Lawrence Roukey’s stone to the summit of Moxie Bald but also Parker carried Sgt. 1st class Shawn Dostie’s stone to the summit. Parker and I signed the stones out of the MEPS office in Portland on August 14th, at approximately 0910 hours, we were a bit late due to traffic we were supposed to be there at 0900, the thought that kept going through my head as I clock watched the entire way from Windham to Portland was; these two Sgt’s would be put together and would not be late. I called and explained we would be a few minutes late however, I was still feeling guilty as I would expect my new CO recruits to be on time and I was at this point not holding my end of this bargain. As I reminisced I felt this may be par for the course for this trek as the original trek was supposed to be Katahdin and over knifes edge but reservations being what they are we had to make lemonade from lemons and it turned out sweeter than we could ever have expected. We left for Kew Bear Camp late that afternoon with Sgt. Roukey and Sgt. 1st class Dostie tucked comfortably in my and Parkers packs, they were protected by the shroud type bags dusted with American flags that came from MEPS. Saturday morning, our hostess and chef Chrissy Cota made breakfast as an Appalachian Trail through hiker stopped by the cabin for fresh water and we invited him in for a bite to eat. Parker proudly displayed the Summit stones and explained to “Fin” what they were and all about our trek to this hiker who had come from Georgia and was on his way back to clear his head. One and a half hours with us and “Fin” was ready to leave trail and go home, apparently he thought we were crazy or we inspired him, personally I think the later is the truth. We hit trail starting at the Baker run river at 1100 crossing the river with Sgt. Roukey and Sgt. 1st class Dostie was a bit of a challenge however rock hopping no one got their feet wet and we were well on our way. The weight of Sgt. Roukeys stone was measurable to an extra water bottle, Sgt. 1st class Dostie’s was a bit more, but Parker carried it with out complaint. This was Faith’s first hike since she was very small; however, she hiked like a Trooper, we can only say that the two Sgt’s we carried and God were with her and the rest of us as we walked and climbed to over 2600 feet. Along the way we met many through hikers, as we stopped and spoke with each, I thought of being in the field with Sgt. Roukey and Sgt. 1st class Dostie and what they would have said to these hikers, they both were Leaders, they both were trainers, they both had words of encouragement, wisdom and honesty for the men and women who worked with them. As we started out of the wooded cover and onto the rock face near the summit, a light rain started to fall, this was a blessing as the heat was approximately 85 and the humidity made the day about 95. We commented that the Sgt’s and God were definitely walking with us, watching over us and helping guide us and keep us safe. As we reached the summit for lunch and pictures the rain stopped, again we knew Sgt. Roukey and Sgt. 1st class Dostie were with us making sure our trek was memorable and impressive. As we ate we conversed with a few more hikers on their way to Katahdin and the summit we were supposed to peak this particular weekend. We all made a pact sitting on top of Moxie Bald that we would take these two Leaders and Military Hero’s to Katahdin with us and started to plan our second Summit Project trek, “Maine the Way Life Should Be” yes so very true especially when you have the privilege of sitting on top of beautiful mountains with Military Hero’s. Our trek down the mountain was uneventful, we played in mud, saw minimal wild life due to the heat, but enjoyed the peace that comes from the wilderness. On September 11th we will once again sign out Sgt. Lawrence Roukey and Sgt. 1st class Shawn Dostie’s Summit Stones and take them to Katahdin with us we will be hiking to the summit and over Knifes edge on the 12th. This is an open invitation to anyone caring to come with us, make your reservations now the more the merrier. Ryann Roukey, we said Happy Birthday to you at the top of Moxie Bald and I know Larry was with us saying it as loud as he could, I could not quit get them to sing. We are so very proud to have taken these stones with us on our first trek, we will so proudly take them on our second, and as they are both avid hikers we know that is why we will have yet again another aw inspiring trip as we carry them because they will be with us in spirit. Thank you again for allowing us into your life, and letting us be a part of helping to remember who these Hero’s were. I can’t begin to tell you how much I enjoyed reading this. It made me think of the one time in our 12 years together that Shawn was late for PT. He panicked like I had never seen him panicked before. lol I would like to thank you for carrying Shawn and his fallen brother along with you. I always smile when I read that Shawn’s rock was heavy because he was a bit on the smaller side in life. My heart smiles knowing that you and others are continuing to keep Shawn’s memory and drive for life alive. The kids and I are forever grateful to you. God Bless you!! On October 17th, 2015, I had the honor and privilege to carry the stone of Army Sgt 1st Class Shawn C. Dostie. As the stone weighed down my pack my mind kept racing back around to previous hikes, previous stories, Shawn’s story, and the odd and unique connections that come out of being a part of The Summit Project. The first stone that I was able to hike with was the stone of SPC Dustin Harris, my brother, was an obvious connection. The second stone I hiked with was the large FAMILY stone, one stone with a personal connection after suggesting to include this stone with the selection of spirit stones but also because of the strong connection I have come to find with individuals who have become a big part of TSP. We have grown to call each other family and embrace each other as such. The next stones I was honored to hike with were those of Mark Goyet and Edmund McDonald. Mark and I both had a love of sports and Edmund and I both enjoy cooking. The next solider I was able to carry the story of was the story of Blaine Adams, who’s connection became even more unique and odd at the same time. Blaine’s stone came from a riverbed were he used to catch snapping turtles. The weeks leading up to the hike with Blaine’s stone I had to have seen at least 15 snapping turtles on the sides of the road and along swamps. Every since I hiked with his stone I have yet to spot another snapping turtle. The stone and story of Shawn did not let down when it came to connections. The first connection that stood out to me was the fact that Shawn and my brother Dustin were both killed in action in the same manner; Shawn lost just three months before my brother. The more personal connection that I really enjoyed about Shawn as a person was the fact he trained many soldiers during his time in the military. I myself have never served, but reading about Shawn and how he trained soldiers makes me know that he was a teacher. Maybe not in the traditional sense of the word but there’s no doubt that he taught those soldiers valuable lessons while training them. I am a teacher myself. I recently relocated and at the moment I am not in the teaching profession but it is a passion of mine. I really enjoyed knowing that Shawn and I had that connection while carrying the weight of his stone and story with me. There were also two quotes I found while researching Shawn that really stood out to me and make me feel emotional about his story. “He wanted me to be proud of him,” – Robert, Shawn’s father. Robert, like I am with my brother, I am positive you are more proud of your son then words can explain. “His work will live on through the soldiers that he trained.” It’s so touching to know that Shawn’s memory will not be forgotten. I hope that as a teacher my work lives on in some way with each student that I encounter along the way. Again, it was such an honor to be a part of the Summit Project yet again and to have it be with the story of Sgt 1st Class Shawn C. Dostie. I thank his family for letting me form a connection with Shawn through TSP. First, let me say that I am so sorry for the loss of your brother. His service and sacrifice as well as your families sacrifice will never be forgotten. I think many times people forget about the siblings of our fallen Heroes and their amount of grief and loss. I know your brother would be beyond proud of you for not only remembering him, but others as well. You have felt the hurt and pain, watched as your family has hurt and grieved, but you have chosen to press forward and honor those who have made the ultimate sacrifice. Thank you Dylan for carrying Shawn with you. My kids and I are grateful to you. God Bless you! I had the pleasure of carrying your son’s rock up Bradbury Mountain in Maine. Even though I did not know him personally, just reading and watching your video made me grow a deep sadness and honor towards Army Sgt. 1st Class Shawn C. Dostie. I can’t even begin to imagine losing a loved one. As a field trip, my English and history class climbed the mountain and carried the rocks of the ones lost in combat. I was honored to carry your son’s, especially because of the man you described him as. While climbing, I looked around and took in the freedom I had due to his bravery. The air was so light and it was a perfect temperature. It made me realize everyday is a blessing that we take for granted, and to make the most of what we have everyday. As I carried his rock, placed it down, and talked about him to my fellow classmates, I thought specifically about his characteristics. Knowing you got his rock from SMCC on the water made me happy to be remembering him in the outdoors. I was proud to represent him on the peak of Bradbury and tell his story. As I looked around at the sun and just the atmosphere of Maine, I hope he’d be happy for his rock to be there. Taking the day to remember Shawn was an honor to me, and brought the realization to me that everyday is a blessing. Some days I take advantage of the day, and hate it. Sometimes life is unfair and takes you too soon. I learned to appreciate every ‘bad’ day from this process. I am glad I got to represent your son as we did the Summit Project. I will never forget the day I had and the beautiful weather as we talked about our soldiers. My name is Max Giard and I had the privilege this past week to carry your son’s, Shawn Dostie, rock up Bradbury Mountain in Maine. It was a true honor to be a part of such an outstanding project which helps our American students appreciate what the American armed forces does for our country. Shawn must have looked up to you, Mr. Dostie, very much, as evident to his choice in pursuing the infantry unit like yourself. My parents were never in the military, but many of my aunts, uncles and grandparents were. I’ve always admired them for their courage, dedication, and commitment to the United States of America. I grew up playing many sports, and currently play ice hockey. My high school hockey team is more than just a team, we are a family. We help each other and have each other’s back- no matter what. I know that being in the military is the same way. Any current or past military personnel would do anything for a fellow soldier. I believe that because The Summit Project has gained so much response and participation. The work put into this project is insurmountable, and the reward of participating in it is never-ending and incredibly worth it. I want to thank Shawn for all he has done for our beloved country and our continued freedom. My name is Brandon, and I am 16 years old, and on Friday December 4th, 2015, I was given the opportunity to carry Sgt. 1st Class, Shawn Dostie’s stone to the summit of Bradbury Mountain as part of The Summit Project. I was very honored to research Shawn, and then eventually carry his stone to the top of Bradbury. I was honored and very excited to be able to be a part of the project as I have a lot of respect for veterans, and active duty soldiers. They give the ultimate sacrifice of risking their lives, in order to protect the country that they love, and the citizens who inhabit it. Bringing Shawn’s stone up the mountain, and then eventually talking about him really affected me and made me realize that once you get to the top of the mountain and are about to start talking about your soldier, you don’t really need a written speech with facts to talk about your soldier, because at the end of the day, you probably won’t find yourself reading off of a written script, but saying something about your soldier that comes from deep down in your heart. While I was climbing, I was thinking really hard about Shawn, and while I was holding Shawn’s stone, I felt as if the stone had a very powerful aura within it, and I knew it was my duty to not let anything happen to this stone, because it was very special. As I hiked Bradbury mountain, I was really thinking about Shawn’s last moments. I was trying to think what he was doing or thinking about. I hoped that he was happy for his last few moments. I also tried to imagine myself meeting Shawn while he was still here. I feel as though him and I could have been good friends because we both shared the traits of a good sense of humor, and being a hard worker. And although I did not have the chance to ever meet him, just holding his stone made me feel like he was right there with me, hiking along. I’ve never lost anyone due to a war tragedy, so I can’t say I know how you feel. I just want to thank you, for Shawn’s braveness in joining the Army, giving citizens like myself the reassurance that we are safe due to people like Shawn. I’m sure that was a hard decision for you all. And I also want to thank you for giving me the opportunity to be apart of this amazing project. It has made me come to realize that death is very unfair in who it chooses. Shawn’s memories and his legacy will live on forever. I certainly will never forget about this experience, or Shawn. Thank you. Thank you for being part of the Summit Project and carrying Shawn with you. I think you and Shawn would have been great friends if you have a great sense of humor and a hard work ethic like he did. I have thought many times about his last moments. In my mind, I hoped that he didn’t know what was happening and that those last moments went fast and without any pain. In my heart, I hope those last moments were filled with the thoughts of his family, especially his children. And, knowing him, thoughts of wanting to know his Soldiers who were with him that day would be ok. I will never know what those last moments were like, however, I do know that he was with you on your hike, and is forever grateful that you had him with you. Thank you again Brandon for honoring Shawn. God Bless you! Within this letter, I would like to show my gratitude towards Shawn and his loved ones. I had the great opportunity to read about him during these last few weeks, and I learned a lot. He was a man of integrity and he put others before himself. Most importantly, this project taught me a lot about sacrifice. It opened my eyes to how much these soldiers like Shawn, put on the line to serve and protect the people of America; and do this by choice. He has become another great role model in my life, and I strive to become more like him everyday. During our hike, I saw a glimpse into what the physical expectations or struggles soldiers like Shawn, could have went through. Although it was beautiful, the hike was difficult, and made me realize that I’m in no way physically capable of what the military demands. I can only imagine that Shawn would have enjoyed himself on the hike. By all definitions he was a great man. Sadly, this made losing him even more of a tragedy. Shawn was a loving husband and father, and he fought to uphold my freedoms in America. Finally, I would like to remind you of continuous impact he has on everyday Americans like me. His sacrifice and commitment to his family and nation will not be forgotten, but be commemorated. Shawn was small, but he was also mighty. He is the Soldier that the Drill Sgt. said wouldn’t make it because he was small and weak. He went on to prove him wrong by putting 100% of himself into everything he did, not only in the U.S. Army for almost 15 years, but in life as well. Thank you for taking the time out of your life to honor Shawn. I know he was with you every step of the way. God Bless you Joshua! I and many others got the opportunity to participate in the summit project. Our school hiked up Bradbury Mountain. We were assigned to small groups and each group was given a soldier provided by the summitproject.org we found a lot of information about Shawn. We found information on where he was stationed and we also learned how he was as a man and he was a very nice,funny, caring person and more importantly he was a loving father. Thank you Eli for remembering Shawn and participating in the Summit Project. Your post made me smile because Shawn was quite funny. And yes, he was also nice, caring, and most of all, an amazingly loving father. Shawn would be the first to tell you not to be sad that he and so many other Soldiers have fallen, but to live your life in freedom and happiness. God Bless you Eli! My name is Colby Watson and I am a Junior at Nokomis Regional High. My JROTC program did a summit project hike up Big Moose Mountain in Greenville. Every one of us carried a memorial stone as we hiked up the mountain and it was my tremendous honor to be the one to carry SGT 1st Class Shawn C. Dosties stone with me. As I hiked up the mountain, I felt like I needed to take constant breaks because of the pain I was feeling from how much I am out of shape, but when I felt like I have had enough of the pain and I needed that break I thought of SGT 1st Class Shawn Dowstie and his family. He passed on the 30th of December, only 5 days after Christmas, that time is supposed to be a time of joy, a time of happiness and on this day all of the Dostie families happiness stopped, and the pain started. That pain will be with them forever and they do not just get breaks, they have do deal with it everyday for the rest of there life. This gave me the courage to push through and make it all the way and to push passed the pain. It was an amazing honor to carry his stone and my condolences go out to his family and his friends. First of all, thank you for carrying Shawn’s stone, and second, thank you for pushing through your pain. Reading what you wrote about losing Shawn 5 days after Christmas has me in tears. Christmas has never been the same for us. So many of our Christmas’s have been spent at Arlington Cemetery, no presents were wrapped, and no tree put up. Please know that the kids and I are grateful for you doing this for our Hero. You are so young, but you understand the meaning behind the sacrifice. God Bless you Colby! I had the privilege to hike with the stone of SGT 1st Class Shawn Dostie on October 1, 2016 at Acadia National Park. I hiked with Team Kebo and enjoyed speaking with and getting to know so many great people while on the hike. As we hiked, I stopped as often as possible to enjoy the vistas overlooking the beautiful shoreline of the State of Maine and felt that Shawn would have reveled in these vistas as well. I am extremely grateful for his and his family’s sacrifice that allowed us this amazing opportunity. Growing up on the Maine coastline myself, I was pleased to know that Shawn’s stone came from the shore near Portland. It had the texture of a stone that had been washed over and again by the rough Maine coast. It was heavy and as I felt it on my back, it did indeed inspire me to work hard and help along my fellow teammates. The most powerful moment was our team’s circle at the summit. I was overwhelmed by the power and pain with which my teammates spoke about our fallen heroes – both those whose stones they were carrying as well as other loved ones who they have lost. A handful of family members of the fallen whose stones we were carrying joined us at the summit and I was struck by the thanks they gave to us for having carried the stones of their fallen sons and daughters. I couldn’t help but feel that we had so much more to be thankful for than they. I was also struck by the number of the fallen who were spoken about who have fallen since returning from overseas, many of whom at their own hands. I was pleased that our circle could shine some light, however little, on this most important issue for our returning soldiers. I feel privileged to have carried the stone and story of Shawn and to be permitted to do so because of the sacrifice that all of our fallen have made for us. I could not be more thankful. Well said grandson. It is an emotional time for all, but especially for the hikers as they carry the “burden” and thoughts of the men and women who went to the foreign lands to protect our rights and freedom. They were all watching above and around you on your progress that was taking place in your mind, heart and on the mountain side trek. Thank you Matt for carrying Shawn with you. I am in awe of how so many of you have not only carried Shawn’s stone with you, but his spirit as well. Thank you for pushing through the pain and never giving up. I know Shawn was with you every step of the way and that he is just as grateful to you as the kids and I are. God Bless you Matt! My English class got to hike Streaked Mountain on October 20th, and I was given the opportunity to carry the stone of Shawn Dostie. During the beginning of the hike, I was honestly a lot more tired than I expected and even complained a little. It is not a very long hike, but it is a very steep climb. A little while later, I had a sudden realization that your son had given up so much more than a couple of hours and had been inconvenienced so much more than a pair of sore legs. Once we reached the top, my thoughts had completely changed from thinking about my legs to being grateful for the independence given to us by our military. Once our group reached the top, we had our lunches and enjoyed the great view. We could see for miles, and I knew that everything I saw was given to us by your son and the other great men and women who came before him. After our short rest, we had a ceremony to honor the soldiers who have passed for this great country. During the ceremony, each of us stood up and shared something about our soldier and where his or her family got the rock. At first I was a little nervous. I am not a great speaker and was not exactly sure what to say, but once I started talking, I forgot about my fear and was able to focus on what I was saying. I had not seen where you found the stone so when I was telling about your son I said that I thought it looked like rocks I had seen by the ocean. Was I correct in my guess? If so was there a reason for it? I really enjoyed the experience of hiking the mountain and thinking about what your son and others like him have done for our country and for us specifically. I was really honored to be a part of this project and am thankful for the Summit Project and the people who started it and maintain it. Specifically, I would like to thank you for telling us about your son and allowing me to learn about him. It was nice hearing something about the family side of a soldier as opposed to just the military aspect of their lives. Overall, I genuinely enjoyed the experience and am glad that I went on the trip. I am the widow of SFC Shawn Dostie. I want to thank you from the bottom of my heart for carrying Shawn’s stone and for pushing on. Had you ever had the chance to meet Shawn, you would see that he had the same drive, even when he was tired, to push through what he felt was impossible and always finishing what he started. Thank you Reuben for not giving up and for honoring our Hero. God Bless you! My name is Caitie Shoberg and I want to thank you for allowing me the great privilege of carrying the memorial stone in Shawn’s honor on October 14, 2017 to the peak of Cadillac Mountain at Acadia National Park. This was my first hike with the Summit Project, and I’ll admit that at first, I was a little nervous about agreeing to do this hike because I did not know what to expect, and I wasn’t sure how to properly honor Shawn’s story. Once I read about Sgt. Dostie and the love and legacy that he left behind, I was no longer worried. I found some connections with him that I had not expected. I learned that he was a loving, caring family man who put everyone’s needs before his own. I learned that while he kept himself busy and was a hardworking man, he also had a sense of humor and loved dancing around the house. My heart was filled because Shawn just sounded like a great guy all around, and I cannot imagine the immense sadness that his family and comrades must have felt when they lost him. One connection that I found was that his stone was found at Southern Maine Community College in 2015 by his nephew, who took walks along the beach during his down time. I graduated from SMCC in 2014, and I often did the same thing between classes- I wondered how many times I had walked past the stone, or looked at the same beach front that held what would become the memorial stone of Shawn. The morning of the hike, I woke up early. I am not normally an early riser, but I thought about the early mornings and long days that Shawn must have put in as a Sargeant 1st Class, especially when he was training new soldiers. I headed to the tent that morning to collect the stone and I noticed that it was one of the larger stones on the table. It definitely looked like a stone that came from the ocean- it was worn and white from where the waves hit it. While the stone was large, I never felt it weigh me down. Its weight reminded me of the mission at hand and inspired me to push forward on our hike. As I was listening to my team members speaking about our Fallen Maine Heroes at the peak of Cadillac Mountain, I felt more emotion than I had expected. I felt honor and pride when I shared the story of Sgt. Dostie. I hope that he was able to enjoy the beautiful views and fall foliage at the top of the mountain. I am so glad for this experience, I feel that the Summit Project will continue to make sure that the lives and sacrifices of these fallen heroes are never forgotten. I want to express my condolences to the Dostie family and thank them again for their strength and for allowing me to carry this stone. I am honored that I was asked to carry the stone of Sgt 1st Class Shawn Dostie. His name is a name that I will never forget. The experience was incredible. I was asked to carry this stone in honor of our fallen hero and I could not be happier to take on the task of learning more about my soldier. The day I found out more about Shawn Dostie was a very emotional day. I learned how much he loved and lived for family and how he was a hard worker and when I watched the interview and saw that he did some family backwoods camping I realized more and more that I could relate to him and felt immediate deep sympathy for the family for he was such an incredible man. It hurts to think that we lost someone so strong who dedicated their life to fighting for our country. That being said, I committed to carrying his stone on my back for a four mile Veteran’s memorial race and not once would I complain about it. The task was a hard one, but not as tough as the the challenges that Dostie had to face and the weight that his family had to carry after losing him. Every time I saw an upcoming steep hill or I could feel my pack digging into my shoulder or something on me hurt, knowing I was carrying Dostie’s stone made me stronger physically and mentally. I had to continue for him. My heart goes out to his children and his wife. I am a Wife and a Mom and and I can’t imagine losing my spouse or my child. I am so grateful that this country has strong soldiers like Dostie that are willing to go to war and put their own lives at risk to protect us. The thought of it makes me tear up in thankfulness and sadness at the same time. The world is a scary place and if it weren’t for our brave soldiers and their supportive families, none of us would be here today. Thank you. I had the honor and privilege of carrying Shawn’s stone and his story up Blue Hill mountain through the summit project on November 10, 2017. In the days prior to the hike, I had the opportunity to prepare myself emotionally and mentally with getting acquainted with Shawn. What an amazing man -an amazing father, husband, son, and soldier. Shawn’s stone was actually one of two fallen soldier stones that I had the pleasure of carrying that day. As I made my way with my groupmates up at Blue Hill mountain, I reflected on what life must’ve meant to Shawn. From everything that has been shared with me, it was evident that Sean was highly respected and was a hard worker all of his life. When asked, his parents wanted anyone to know that Shawn loved his family, he loved his children, and he was a hard worker for his family and his country. It sounds as though he was an excellent teacher – he educated many a men during his time as a sergeant in the army first class. He Wanted to make his father proud of him, he enlisted at the young age of 18 and followed in his father’s footsteps. But the thing that really stuck out in my mind was something that you had mentioned, Stephanie, and that you had said that Shawn may not have been big in stature but that he was big in life. This really struck accord with me as I carried the weight of Shawn’s stone and his story to the top. A father, a husband, a son, and a soldier taken way too soon but living life in a big way. He jumped out of airplanes, he was a member of the infantry, he did it all. It really inspired me made me reflect on if I am living the big life in the ways that matter. He certainly did. Stephanie – my heart goes out to you and your children. I can’t imagine being taken from my children. I have twin daughters age 10 and I am a single parent. I want to thank you for the sacrifices that you have made in your life and that Shawn made to ensure that my daughters and I have the freedoms that we have today. It was an experience that I will not soon forget and I will carry Shawn’s story with me. God bless you. On November 11th, 2018, I had the honor and privilege to carry the stone of Army Sgt 1st Class Shawn C. Dostie at the YMCA 4 mile Veterans Day run in Ellsworth. In the days prior to the run, I had the privilege of learning about Shawn and watching a video his parents had done for the Summit Project. What a wonderful and hard working man he must have been. A soldier, husband, farther and son whos life was taken at the young age of 32. This is my 3rd stone to carry and I always wish I knew more about the lives of the fallen. You develop such a deep emotional bond with them. You never forget their names or their story. They become a part of you in a way. You see their stones at events and immediately recognize them. Maybe its strange, but I always have to touch the stones I have carried. There is just a connection there that I am sure anyone who has carried a stone will understand. The day started early, cold and wet. At the start of my 2 hour drive I really didn’t think I was ready to run 4 miles… let alone to carry a stone while doing it. I got to the YMCA and met my 2 friends and long time coworkers that I had suckered into coming along for the day. Plagued with different injuries we joked that if we combined the parts of us that actually worked we may have one whole “runner” amongst us. Only 2 of us were carrying stones and we found our way over to the table to pick up our assigned stones. I honestly believe everything happens for a reason and once at the table I found Shawn’s stone sitting next to Jay Aubin’s stone. The funny thing is Jay was the son of my Dads late college roommate and I can remember hearing him talk of Jay when he would visit my dad. I recognized his photo first. I couldn’t help but smile and touch his stone. I collected Shawn’s stone and safely wrapped it in a towel and placed it in my back pack for the 4 miles. I got ready for the start of the run hoping I could run the entire 4 miles and not walk. I didn’t want to let Shawn down by walking. I found myself struggling in the cold air and worrying that I would have to walk around the 1 mile mark. As the thought entered my mind an oak leaf that was falling from a tree hit me smack in the face. I tried to avoid it when I saw it coming at me, but it danced in the wind prior to smacking me square in the face. My running partner and I both had to laugh because I had tried so hard to avoid it. Why? I don’t know. It was just a leaf. I took it as a sign to get those negative thoughts out of my mind and carry on. My partner carrying the stone and I plugged along the route reading the signs as we passed them one by one. (Our 3rd member so far ahead now that we could no longer see him.) So many of the lost were just so young. You think of all they had missed out on in life. The run was going pretty good, but the only warm spot on my body was where the stone was touching my back. Then came the hill with the turn. I thought this was it – my breaking point – the point I may have to walk, but I forced myself up the hill. It was slow and I probably could have walked faster, but I was NOT going to walk! I made it to the top and as I ran back down the hill I see Shawn’s sign at the bottom of the hill. Seeing the sign got me to the end of that run. Thank you for your service Shawn C. Dostie. You will not be forgotten. My thoughts and prayers go out to your loved ones. May you watch over them and the troops that you trained. On November 10th, 2018, I had the honor of carrying a beautifully shaped oval stone for Sgt 1st Class Shawn Dostie. I had never done anything like this before but felt compelled to participate because of a friend who has carried stones for TSP up several mountains. Her dedication to the cause and willingness to get out of her comfort zone climbing big mountains had impressed me. On this day the stones were being carried up Blue Hill Mountain which is almost in my backyard and is considered a sacred place by many, including myself. I care for this little lone mountain by stewarding all the trails, so it only seemed fitting for me to share this special place with such an important project. It was a drizzly raw day on Blue Hill but I felt such warmth and love from all the other participants who did not seem at all phased by the weather. There was a sense of camaraderie, intense emotions and deep purpose that carried us together to the summit. The more I learned about Shawn as I read about him, the more I wished I had known him. He seemed like an amazing person. He was so dedicated to serving his country and protecting his people, especially his platoon of 12. I especially liked reading about his bright blue eyes, his smile, sense of humor and how he enjoyed dancing around the house. What a lovely picture of him. I am a mother of 2 young men, aged 24 and 26. I love them deeply and cannot imagine losing them and cannot imagine the pain of that loss. Dear parents, sister, wife and children of Shawn, Please accept my heartfelt condolences of losing him. He was and always will be a hero. Thank you for sharing his stone with me.